I just had to share this photo of an amazing bird. 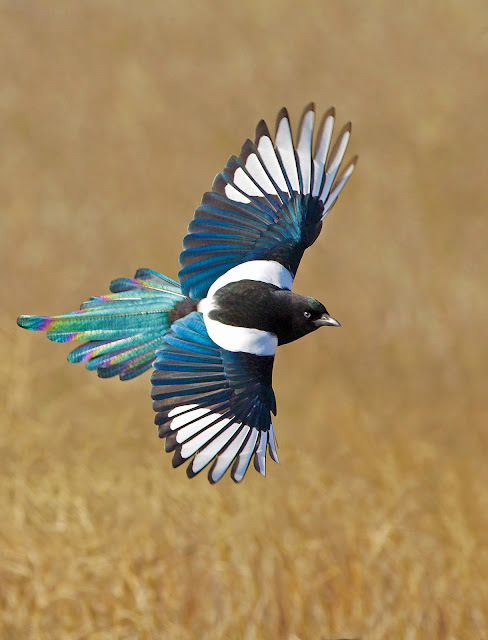 We don't have Magpies in Maine so I was 50 years old before I ever laid eyes on one. What a beauty. I love Crows and Ravens but this bird is just too beautiful and a member of the Corvid family like Crows. Gorgeous! I love the rainbow tail! Gorgeous, yes...but we have an abundance of them here on the Central Alberta Prairie...and they are birds of prey...sometimes destroying the eggs of other birds. It's challenging to live around magpies! I can imagine. I know they are not liked and considered dirty birds but I think the bird's "Design" is breathtaking.